Originally Italian from Rome, Bruna was involved in various humanitarian projects in Africa and South America before going to Bangladesh and falling in love with the country and the people. And never before had she come across anyone else with Ali’s approach to helping the disabled. Bruna has worked in many fields – PR, teacher, fund-raiser – and in many countries. She loves cooking (the Italian connection), travelling and reading. Bruna is always on the move and is known as “The Girl with the Suitcase”. Dinah has run her own literary agency for 30 years. Her clients include the scientist David Deutsch, historians Malcolm Billings and Daniel Snowman, war correspondent and journalist Sandy Gall and novelists Wendy K. Harris and Marcia Willett. She had always loved India, then became interested in Bangladesh from reading a young author’s travel memoir. She knew she would need an introduction to visit the country and fate intervened. She met Bruna who was bubbling over with enthusiasm about Ali and what, with her support, he was doing for the children of Bhola. Dinah decided to visit Bhola with Bruna in November 2006 and immediately knew she had found a new and important cause. Dinah chairs the trustee meetings and runs the charity day to day from her office. Were it not for Anne Hamilton, Bhola’s Children as a charity might not exist. 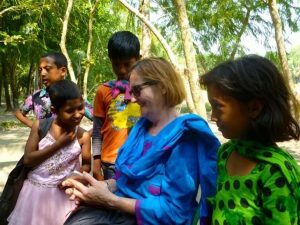 When she was thirty Anne spent several months in Bangladesh, working for an NGO. She subsequently wrote a travel memoir A Blonde Bengali Wife and sent it to Dinah who took her on as a client. It inspired Dinah to go to Bangladesh. A Blonde Bengali Wife was published in October 2010. Anne lives in Edinburgh, where she has completed her PhD and combines freelance writing and teaching and caring for her young son. Simon has been visiting Bhola Garden since the age of 14 months and is a great favourite with the children. Sandy’s family already had deep connections with India (before independence), East Pakistan/Bangladesh and Burma when he met his future – now sadly late – wife, who was an Indian born in Burma. Sandy recently retired but previously worked as an economist providing consultancy and research services on government policy issues in particular relating to taxation and pensions. He is a qualified chartered accountant. Barnaby is married with two children. He works in London as a fund manager. Barnaby previously had no connection with Bangladesh, but his mother Dinah’s enthusiasm for Bhola did not exactly go unnoticed. He was touched by Ali’s story and saw the opportunity to extend the family involvement in the venture. Nick met Dinah as a guest at an Author’s Club lunch in 2010 and agreed to become a Trustee to help Bhola’s Children in areas of communicaton and marketing. His background is in online content creation, web and film production. Nick has not yet visited Bhola but does intend to. He lives in South East London with his partner. Freda met Dinah while playing bridge, Dinah was enthusiastically and passionately talking about the wonderful children she helped on Bhola Island. Freda subsequently visited the home and found that it was everything Dinah said, a happy, loving home where children with many different disabilities lived together in a family atmosphere. Freda was a nurse who has worked for Medecins sans Frontieres (Doctors without Borders) and has been a Trustee of two charities supporting projects in rural Uganda. She lives in London and has 3 children and three grandchildren. Michael Maude is distantly related to Dinah Wiener and through family connection was introduced to Bhola’s Children. 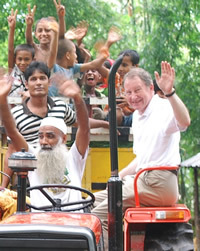 Now retired, he has travelled to many countries including Bangladesh in his work in the construction equipment business. He is a qualified engineer and sometime farmer and administers a family charitable trust which gives Bhola’s Children regular financial support. Andrew is originally from Canada. He is now married with four children and lives in London where he works in management consulting to the financial services industry. Andrew is the most recent trustee to join Bhola’s Children and is very much looking forward to his first visit to Bangladesh in January 2019.